Patterson, Robert. A Treatise of Practical Arithmetic, Intended for the Use of Schools; in Two Parts. Pittsburgh: by the author, and by M. Carey and Son, Philadelphia, and others, 1818. 12mo, full leather, black leather label with gilt lettering on spine, boards had gilt border, now nearly worn off; marbled endpapers, 156pp. From the Retirement Library of Thomas Jefferson, purchased at the sale of his library in Washington, February 29, 1829, held by Nathaniel P. Poor. This volume number 387 in the sale (on p. 8 of the catalogue). 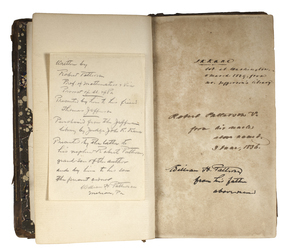 Jefferson indicated ownership with a manuscript “T” before the “I(=J)” on the signature page of the 9th gathering (page 97). (Last signature in volume is “O”, thus no opportunity to add his “J” to the “T” signature, which he did in larger volumes.) 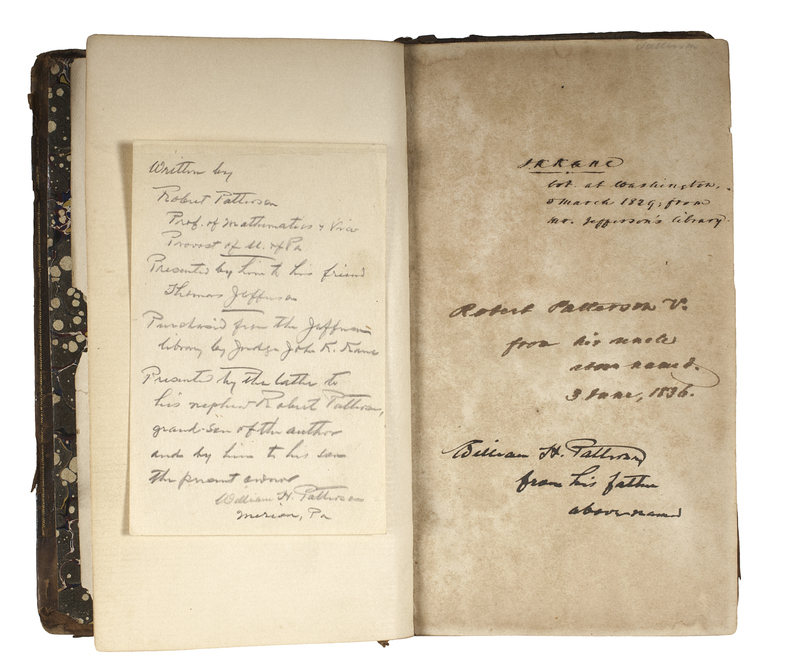 Jefferson never had a bookplate, and occasionally, but seldom, wrote his name on an endpaper. Most often he created his initials discretely at the foot of these pages by inserting a small T before the I and a J after a T if the volume was large enough. There are just a few annotations and corrections in the volume, none of which can be directly attributed to Jefferson (see condition). On free endpaper just before half-title, is ownership information written in three inscribed “blocks.” J.K. Kane / got at Washington. 2 March 1829, from / Mr. Jefferson’s Library. Second block: Robert Patterson V. / from his uncle / above named / 3 June 1836. And the third: William H. Patterson / from his father / above named. There is also a separate note on 3 x 4.5 in. 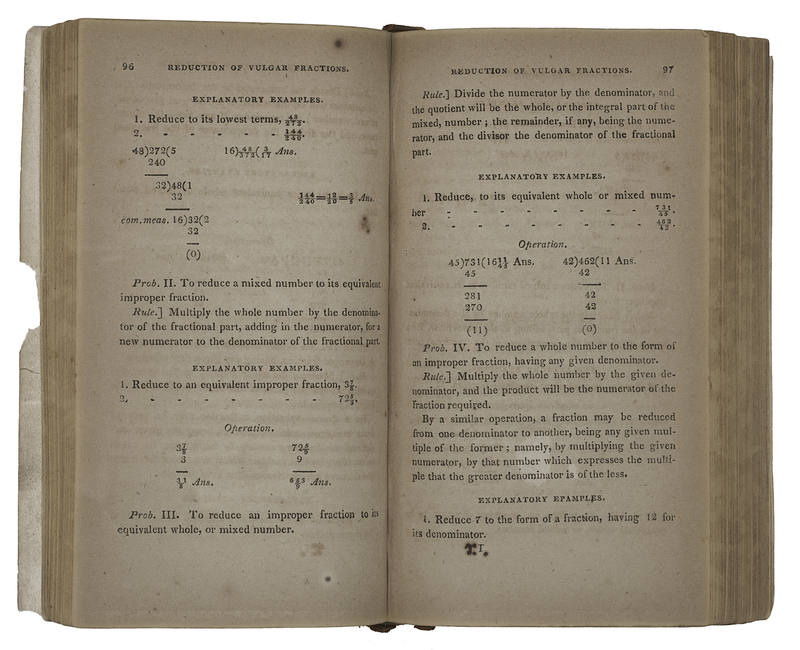 slip of paper in 19th century hand further illuminating the relationships: Written by / Robert Patterson / Prof. of Mathematics & Vice Provost of U. of Pa. Presented by him to his friend Thomas Jefferson. Purchased from the Jefferson Library by Judge John K. Kane. Presented by the latter to his nephew Robert Patterson, grandson of the author and by him to his son the present owner / William H. Patterson / Morison, Pa. Acquired by the consignor from the estate of Robert Patterson, VIII, who died in 2010 in Citrus Co., FL. 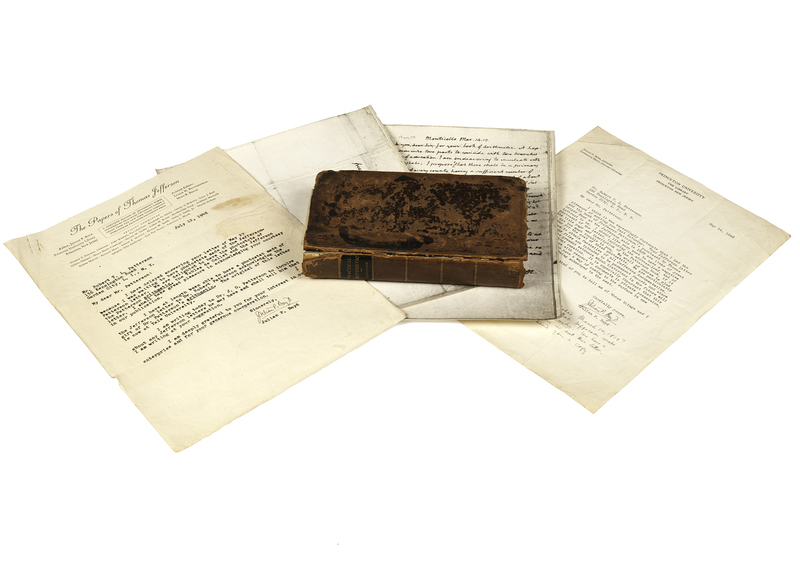 Accompanying the volume are two letters and two early Photostat copies of a letter from Jefferson to Patterson dated March 14, 1819. One letter is from Julian P. Boyd, Librarian of the Princeton University Library dated May 14, 1948. Addressed to Robert T.L. Patterson, Mr. Boyd expresses Princeton’s interest in both the book and a Jefferson letter that Mr. Patterson owned (not with this lot). On July 12, 1948, Boyd wrote Patterson again, this one on the papers of “The Papers of Thomas Jefferson” letterhead. Boyd expresses to Patterson that he had delayed answering his earlier letter while waiting for the Photostats of the March 14 letter and notes that the original is at Yale University. He also expresses his thanks for copies of Patterson’s letter and the arithmetic book. 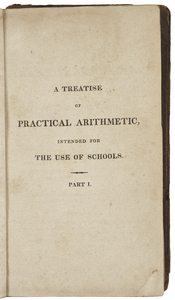 In his letter to Patterson, Jefferson thanks him for the book of arithmetic and then goes on to note: [I]t happens, by the division [of the book] into two parts to coincide with two branches of the triple grade of education I am endeavoring to inculcate with the legislators of our state. I propose 1. that there shall be a primary school in every ward of every county, having a sufficient number of children to make up a school. 2. a college in every district of about 80 miles square, which would place every father within a day’s ride of his son at college. 3. an University. [I]n the 1st every citizen to be taught reading, writing, & elementary arithmetic; in the 2d, Greek, Latin, French and the higher branches of numerical arithmetic. In the 3d the higher branches of science. The division of your book is adapted to the 1st & 2d grades, except that it may be proper to go further in the 2d part, into the rationale of the subjects, as this grade of education is as much as the great body of our midling class of citizens would wish to acquire. The book will therefore be generally useful to others, & particularly so to us. I cordially congratulate you on the proof lately given by our society of the estimation in which they hold you, & which you have so long and so eminently merited, and I salute you with constant and affectionate respect. [signed] Th.Jefferson. Thomas Jefferson was a quintessential “Renaissance Man,” as interested in archeology and architecture as in law and politics. He spoke five languages, studied religion and philosophy, and was an inveterate tinkerer and inventor. He was also a lifelong lover of books. Born in 1743 at the family home in Shadwell, Goochland (now Albemarle) County, VA. Upon his father Peter’s death, Jefferson inherited 5,000 acres of land, between 20 and 40 slaves, including a number of books. In February 1770 a fire destroyed Shadwell and everything in it, including the books. Almost immediately after Shadwell burned, at the age of 26, Jefferson began planning and building Monticello, and included a new library. Scholars have identified several subgroups within this, the largest, Jefferson library. The 1783 library is the first recorded in a catalog. It is speculated, although not known for certain, that Jefferson took this catalog with him in 1784 when he took up the appointment as minister plenipotentiary of France. The list is said to have included volumes he hoped to acquire as well as those he owned. While in Europe, he did acquire about 2,000 volumes, for which he constructed a separate list (the 1789 catalog). The 1783 catalog was in a bound volume, and by 1812 had so many notes crammed in and around the original list, that Jefferson recopied it. When the British burned Washington in 1814, Jefferson was so outraged that he offered to sell his library to Congress to replace the Congressional Library lost in the fire. The manuscript copy that Jefferson had maintained was claimed as personal property of George Watterston, the Librarian of Congress. When Watterston was dismissed in 1829, he apparently took the list with him. It has never been seen since. Jefferson’s books would become the basis of today’s Library of Congress. After the sale, Jefferson immediately set about forming a second library. He again kept a bound manuscript catalog of this “Retirement” library. This is the library that Nathaniel Poor sold in Washington, DC in 1829. The present volume is listed as lot 387 (on p. 8) of Poor’s catalog for the sale. Jefferson’s book collecting might today be considered obsessive, although on another level, he may have needed most to keep his always-active mind occupied. It may have played a role in his financial situation (i.e., not good) at the time of his death, although many books were sent to Jefferson as gifts, and for a kind of “review,” hoping that his appreciation would encourage others to buy. John Kintzing Kane (1795-1858) - the first owner of the book after Jefferson- was born in Albany, NY, and after graduation from Yale University and admission to the bar in 1817, established a legal practice in Philadelphia. He began his political life as a Federalist, then shifted to the Democratic party. He was a supporter of Andrew Jackson, and received a number of appointments during that administration. He is thought to have written the Jackson “position statement” on the United States Bank. He was later associated with James K. Polk. When Polk nominated Kane for an appointment as U.S. District Court Judge for the Eastern District of Pennsylvania, he was confirmed and held the position for the remainder of his life. Kane married Jane Duval Leiper in 1819 and the couple had seven children, one of whom died in infancy. Of the six who survived, several went on to become well-known in their own right. The oldest son, Elisha Kent Kane (1820-1857), became a medical officer in the U.S. Navy, and was a member of the two Grinnell Arctic expeditions (indeed, he organized the second) to rescue Sir John Franklin, the British explorer. He explored farther north than any had before, but had to abandon his ship to the ice and march 83 days to Upernavik. After returning to New York, Kane went first to England to report personally to Lady Franklin, then to Havana on the advice of his doctor to recover his health. He died in Havana, and his body was shipped to New Orleans, then by funeral train to Philadelphia. The Kanes’ second son, Thomas Leiper (1822-1883), became an attorney, obtaining a position as Clerk of the District Court in eastern Pennsylvania. Thomas had strong abolitionist views, and the 1850 Compromise and Fugitive Slave Act caused much concern. In 1855 his father decided a case denying an escaped slave legal rights and penalized the abolitionist who helped her, incurring the wrath of the abolition movement. The younger Kane could not in good conscience fulfill his legal obligation to return slaves to their owners, so he resigned his position with the court. His father then had him arrested and imprisoned for contempt of court, although the U.S. Supreme Court overruled the arrest. In spite of this disagreement, Thomas and his wife, Elizabeth Dennistoun Wood, continued to live in his father’s house. According to contemporary reports, Judge Kane turned a blind eye to the parade of Negroes through the home, people who disappeared each evening, while continuing to uphold the slavery laws in the court, thus becoming an abolitionist in deed, if not in name. Judge Kane died in 1858 before the issue was settled by violence. When the Civil War broke out, Thomas Kane enlisted and formed the “Bucktails,” serving as the Colonel of the First Pennsylvania, and later achieving the rank of General. Son number 3 was Robert Patterson Kane (1827-1906), also known as “Pat.” He became a lawyer specializing in patent law. Robert Patterson was born in Ireland in 1743. A good student, especially in mathematics, he was unable to continue his education at the university level because of the poverty of the family. When France invaded Ireland in 1759, he enlisted in the militia. He excelled at military exercises, as well, enough so to come to the attention of the regular army. He was offered a commission, but refused since his dream was to immigrate to America, which he did in 1768. Once in the states, he found a teaching position in Bucks County, Pennsylvania. He had a knack for determining position from astronomical measurements, so he decided to return to Philadelphia to teach navigation. Patterson later obtained a position as head of the Wilmington Academy in Delaware in 1774. With the outbreak of the Revolution, he volunteered as a military instructor. He served for two years until the British army left in 1778. He applied successfully for a professorship in mathematics at the newly reorganized University of the State of Pennsylvania, a position he held for over three decades. He became Professor of Natural Philosophy and Mathematics and Vice-Provost from 1810 to 1813. He was succeeded by his son, Robert M. Patterson. In 1805 his friend, Thomas Jefferson, appointed him Director of the United States Mint, a position he held until his death in 1824. Patterson and Jefferson knew each other from the American Philosophical Society, and he was one of five men from the society selected to instruct Meriwether Lewis and William Clark before they set off on their journey west. Patterson served in a number of other positions, including the Select Council of Philadelphia and the Franklin Institute of Philadelphia board of managers. 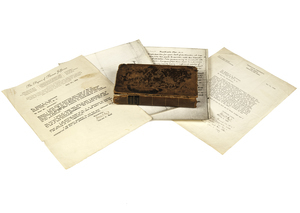 He also wrote numerous papers and books, some based on lecture notes from his days at the University. 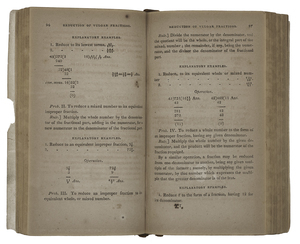 One of those was the present volume, A Treatise of Practical Arithmetic, but it proved too difficult for the beginners for whom it was intended. Patterson continued his involvement in the community and education until his death at the age of 81. Condition:Leaves moderately toned; boards separated, leather flaking, with most gilt gone on boards. Text block tight. Corner torn on pp. 123-124; small notch from long side on 195-196; neither affects text. Notations in volume: p. 51 - 19.2 underlined, below is 96, also underlined. Neither the 6 nor the 9's look like Jefferson's hand, but numbers are a bit difficult. p. 192 has the longest entry in the volume: "X 126 grains = 21 shillings, or 6 grains = 1 shilling / 270 grains = 10 dollars." The initial lower case "s's" are distinctly not like Jefferson's. Also, the "7" does not have the left "hook" that Jefferson nearly always made. In addition, the dark black ink and very narrow line resembles the owner's identification of Kane from the front endpaper. P. 202 - "shill" written above numbers, same features as "s" and thin, dark line as on p. 192. P. 205 - correction to multiplication (2 numbers overwritten), cannot attribute. Part 2, there are pencil notations on pp. 61-63, 86, 114, 128. Last is definitely not Jefferson, and others probably aren't either. P. 65 - "ion" in "Explanation" crossed out and "ory" written above in iron gall ink. Not enough to attribute to Jefferson.